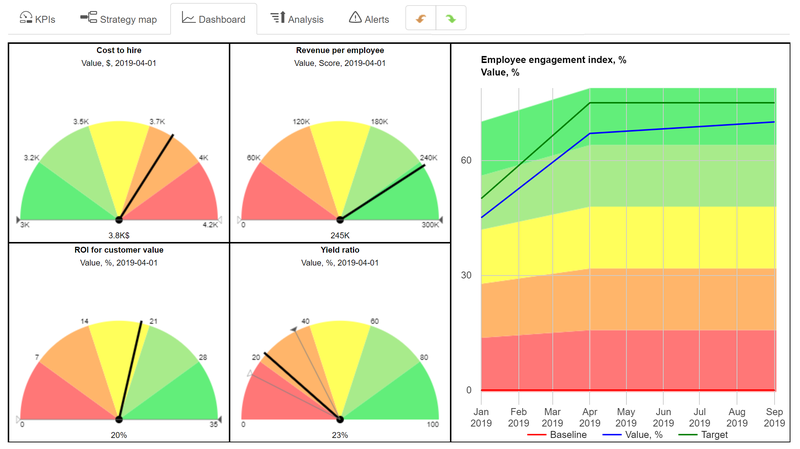 Find the detailed analysis of the best KPIs for HR including hire, retention, and ROI metrics. 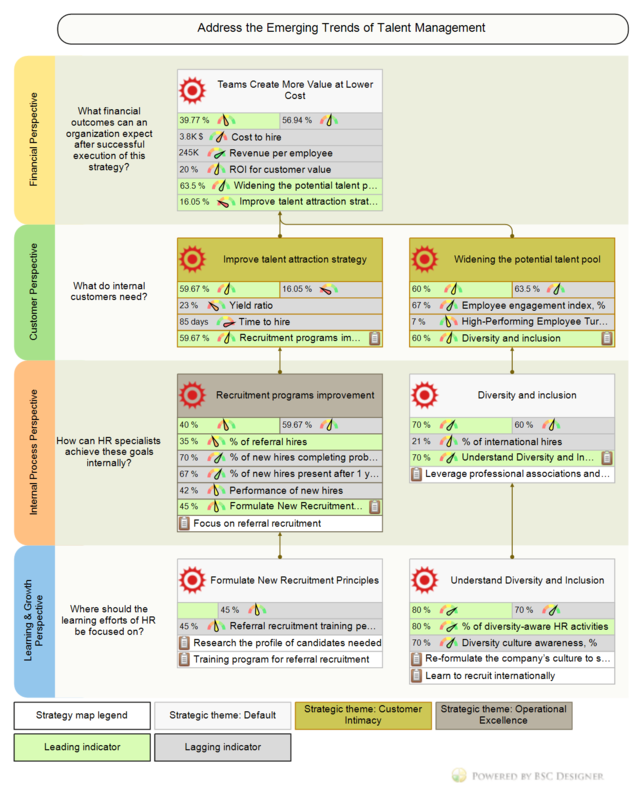 Learn how to describe and execute talent strategy with HR Balanced Scorecard. HR Balanced Scorecard online, sign-up with a free account to unlock all functions. Starting small is a good idea when one needs to measure performance. Before, we discussed 6 essential KPIs for any organization. What about the HR department? What are the most important KPIs to track? Let’s discuss these indicators in detail. Yield ratio in HR shows the percentage of candidates from the recruitment sources that were selected for the next stage of a hiring process. It allows HR and CEO focusing recruitment strategy on reaching the right candidates at a lower cost. Yield Ratio, % = (Number of leads from recruitment method / Number of candidates invited to interview) x 100%. In simple words, yield ratio shows the efficiency of the specific recruitment method. A company posted information about new positions opened in the job section of a professional community on LinkedIn. During the two weeks, 200 visitors followed the given link, eight of them filled in a contact form and two were shortlisted for an interview. The company used online ads to promote the new position. The average cost per click was $1.20 and a company has got 154 clicks; the total cost of the campaign was $200. 20% of visitors (30 candidates) filled in a contact form and sent their CVs. Among these CVs, 12 persons were invited to an interview. The yield ratio for the second case is higher, but we should take into account the cost as well. In the second case, the cost of getting 12 candidates to interview was $200, while in the first case, the direct cost was zero. If you deal with a small number of candidates, then yield ratio won’t tell a story. Three visitors have seen the first ads – one filled in the form, the yield ratio is 33%. Four visitors have seen the second ads – two of them filled in a form, the yield ratio is 50%. The error factor of the yield ratio in this case is too high – we cannot make any decision on which method is better. Knowing the yield ratio on different levels, we can build a yield pyramid. For example, we plan to open four positions for software developers. We know that the interview to hire ratio is 30%, so we need approximately 14 interviews. Candidate to the interview ratio is 20% for the selected method, so we need approximately 70 leads from this source. Time to hire might be a good indicator of the HR hiring process, but it should be more about the way talent managers spend their time budget than about the time itself. On the one hand, time to hire is supposed to show how fast HR is able to process leads and convert them to interviews and later to hires. In this case, it is a lagging indicator for HR with “faster=better” optimization. On the other hand, it might indicate how carefully the company examines new talents. In this case, it is the leading indicator for future employee performance. Basically, the performance of HR specialists is supposed to be estimated by how quickly he or she fills the opened positions. The speed is important, but this indicator is easy to game – it should be balanced by a few quality indicators. Let’s talk more about the leading part of the strategic goal “Fill positions with high-performing talents.” Time to hire is obviously a leading factor, but it doesn’t sound like the main one. It predicts how quickly the organization will be filtering new talents (a good starting point), but it is a poor predictor of the future quality of new hires. In this case, we need to look more at how talent managers spend their time budget. Let’s discuss the number of interviews as a leading indicator for future performance of new hires. What measurement scale can we use for the number of interviews? I believe the minimal value for this indicator should be at least one interview. What about the maximum value? Well, there are organizations that conduct seven interviews, so let’s use seven as a maximum number of interviews. What’s the golden mean for the number of interviews? According to Todd Carlisle, Google’s director of staffing, after the fourth interview “the candidate’s average score would converge on his final score.”. By doing less than two interviews, we are increasing the risks of bad hires because decision makers do not have enough information. By doing more than four interviews, we are increasing the risk of bad hires because excellent candidates might simply not survive the hiring process itself. A good strategy might be to replace formal interviews with less formal phone calls or breakfast meetings. What’s the application of this metric? In this part of the article, we will focus on KPIs related to effective talent management. Training metrics – learn how to track learning and professional development efforts. Tracking soft skills – learn how to track something intangible like leadership. Engagement index – engaged employees are the leading factor of higher company performance, learn how to measure and improve it. 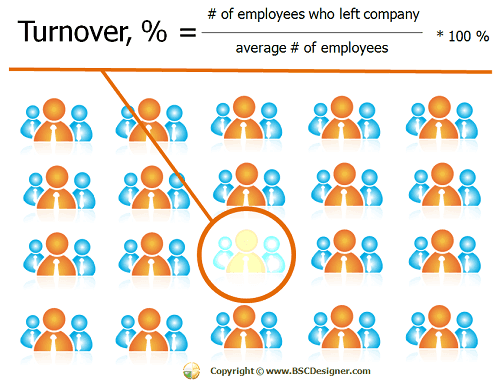 Turnover rate – understand turnover rate, calculate turnover among top performers. What if we don’t and they stay?! Training and professional development are key factors of preparing your organization for the current and future challenges. How to quantify and measure training initiatives in the company? How long does it take to complete a training? Is another process-oriented indicator. It correlates with the cost of training and might be a good indicator of the efficiency of the training program. We can name a number of other process-related metrics, but those metrics will not make much sense until we find proper lagging metrics for training that will provide timely feedback on our training efforts. How to find those effectiveness metrics? A Kirkpatrick levels model is very useful for this challenge. We have discussed this model and its application to the training effectiveness of KPIs in the previous article. Here, you have an executive summary. Immediate reaction – how well the employees accepted training emotionally. That’s what conference organizers typically measure when they ask for after-talk feedback. Learning outcomes – an estimation of the information that was assimilated by the trainees. That’s what HRs measure using after-training tests. Behaviour – the tangible impact of the training on the behaviour of employee, e.g., if your team actually implemented the ideas learnt. Impact – while the change in the behaviour is a good starting point, we need to make sure that this change resulted into the business performance improvement. In the mentioned article, you will find more ideas about how to find the metrics for this four level model. Another interesting topic is how to apply this approach to measuring soft-skills training – we’ll discuss it below. Let’s discuss how one can quantify and measure the effectiveness of soft skill training like, for example, leadership training. I suggest starting with a classical approach – getting feedback from the persons involved. A kind of 360-degree feedback. Present their answers on some scale, calculate an average, and here we have a desired number. The estimation will be subjective and obviously biased, but at least we have some starting point. How to get more realistic measurement results? We need to get a better understanding about leadership training. We need to understand how it is supposed to help with the current goals of the organization. You paid for this leadership training and there is supposed to be some tangible reason behind this decision. Try to find and isolate this reason. For example, your turnover rate is too high compared to the industry average, or there are too many internal conflicts. Well, here you have your KPI, quantify those factors to find the lagging indicator for the leadership. As we have discussed in the “Calculating Talent ROI” chapter – you will probably not find the dollar value for the leadership training, but at least you will quantify on the value created for your organization on the internal customers. Those were lagging indicators. What about leading ones? Do you want to have some good KPIs? Well, my recommendation is – “Do something measurable!” In the example below, I explain what I mean. Employee engagement is one of the leading factors of employee´s performance. Respectively, high employee engagement leads to overall organization success. What is NOT Employee Engagement? First of all, it is a feeling, like love is. And we cannot quantify feelings; what we can quantify is the perception of the feelings. For example, using “proxy questions” that serve as some indicators of the degree of the examined feeling. One of the recognized approaches to quantifying employee engagement is The Gallup Q12 Index. How useful is this index? The absolute value (15%) is probably useful only for the purposes of benchmarking, e.g., tracking annually how employees from different countries answer the same set of questions. If you are not gathering statistics, then I guess, your interest in employee engagement is about measuring and improving it. If that’s the case, I do recommend having a look at the same list of Q12 questions and try applying it to the business realities of your organization. Here are the questions of The Gallup Q12 Index, let’s try to quantify them. The improvement plan might be as simple as creating a ¨role requirements¨ document and revising it for clear language and up-to-date information. For some roles, a good strategy map might be a solution. Metric: Tools and materials availability. Beyond obvious ideas, think about software licenses, internal tools that free employees up from routine tasks. 3. At work, do you have the opportunity to do what you do best every day? It’s hard to say how different employees understand this question. My personal perception is a balance between tasks that require my expertise (like writing this article) and tasks that I consider a necessary evil (like filling administrative forms). As you can imagine a routine “thank you” email every seven days won’t work. One of the best practice ideas is to split large tasks into smaller tangible chunks so that both employee and manager have a better control over their progress and respectively had more specific reasons to praise for doing good work. 5. Does your supervisor or someone at work seem to care about you as a person? The “caring” aspect is probably a lagging indicator of the general climate in the company’s office. 7. At work, do your opinions seem to count? In the context of this question, I’m thinking about the innovation system that we have discussed before. Do you know what is the mission of the company? Do you understand what exactly the mission of the company is? Do you understand how exactly the mission is relevant to what you do? In the cascading article,we discussed how to cascade goals across the levels of organization. The mission (as a top level goal) needs to be cascaded and explained on different levels in a similar way. 9. Are your associates (fellow employees) committed to doing quality work? A proper measurement culture is one of the ways to approach this challenge. The quality scorecard itself will also work as a powerful tool. 10. Do you have a best friend at work? Not sure, if/how this should be quantified on the business scorecard. If you have some ideas, feel free to share in the comments. 11. In the last six months, has someone at work talked to you about your progress? Similar to question 4, but this time we are looking at a larger time scale. The Gallup Q12 is a good starting point for your employee engagement index, but it doesn’t mean that you have to copy it. I would recommend starting to review the questions from the viewpoint of your organization. What about employee morale? How is it different from engagement? Can we quantify morale? Think about employee morale (“happiness” and similar) as a leading factor of employee engagement. Morale or happiness are feelings that contribute to the employee engagement, but the connection is not straightforward. Happy employees are not necessary the most engaged ones. How to quantify and measure morale? The easiest way – ask your employees. Do it a form of a light-weight survey, use a smartphone app, use a “mood” widget for your project management tool, or simply look around and do what most human beings do naturally – recognize behaviour and body language of people around you. For some more practical examples look at the military strategists. A classical example in this case is Von Clausewitz, who emphasized the importance of morale factors. High turnover rate is traditionally perceived as something negative. Well, it’s not always the case. Let’s see what turnover indicators one needs on the performance dashboard. If your high-performing employee left your company, then it is negative. If you replaced someone who was under-performing with “fresh blood,” then high turnover will result in a positive change in your organization. Let me illustrate this idea by taking the Apple company as an example. As long as Apple is considered a “cool” place to work, this company prefers investing more in hiring and training than in keeping turnover low. Check out the latest data by Pay Scale. When I checked the list, “Eastman Kodak Company” was in first place with 20 years’ median employee tenure, while Apple’s median tenure was 2.3 years. Apple works as a talent filter and magnet, keeping high-performers turnover lower and poor-performers turnover high. The ideas and results of HR presented in the boardroom are always questioned from the financial point of view. Here are some finance-related metrics that will support the arguments of talent managers. The good thing about this KPI is that one can find revenue and employees data online. For example, search for “annual ranking of the fastest-growing private companies” by Inc.com or use Hoovers. Once you have a number, you can compare it with your data. The number of employees might vary during the reporting period, so companies take an average value. Also, if a company employs part-time employees, then for this formula, it is necessary to use FTE (full time employee equivalent). It makes sense to compare the revenue per employee with the industry average to have another point of view on the company’s efficiency. What Does Revenue per Employee Mean? Don’t expect too much from this indicator. In the world of disrupting technologies, these numbers might be tricky. Let’s take Apple´s revenue as an example. With $2.13 million per FTE compared to average $0.47 million per FTE, Apple looks a “little bit” understaffed. Should they immediately invest in changing the situation and hire more employees? I doubt it. Still, this metric allows getting a rough estimation of how a company is compared to others. A number of good ROI indicators could define the boardroom credibility of the HR specialist. Let’s see if ROI makes sense in the talent management domain. Calculating a precise dollar value of a customer service specialist or a software engineer doesn’t look like a realistic task. If you are looking for some good examples of how to impress customers, check out the “Raving Fans!” book [Raving Fans! Ken Blanchard, Sheldon Bowles, Collins, 1998]. I think the idea with calculating ROI by using customer value instead of dollar value is clear now. What about those who don’t deal with the customers, like for example, IT unit? Actually, they deal with customers as well, but in their case, we need to think about the value they create for internal customers. 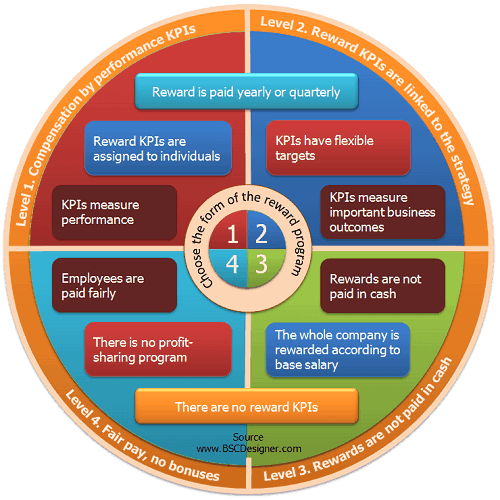 The metrics for reward and compensation is the most disputable topic in the HR domain. Let’s discuss if/how one should link reward to KPIs. I have shared my point of view on this topic in the Compensation and Reward KPI Best Practices article. You will find an executive summary below. If you are curious about underlying arguments, I would recommend consulting the original article. There is no “one size fits all” in reward – we discussed at least four levels; your level depends on geography and type of your business. Solving talent management challenges is not just about tracking some KPIs. One needs to understand where these challenges are coming from and how to address them. In this chapter, we’ll discuss possible strategies for HR and how to formulate them using the Balanced Scorecard Framework. HR shared service is one of the popular ways that organizations use to optimize the costs of talent management. The transition to this model sounds like a logic step to save on scale. At the same time, new questions related to the quality of provided service and respective internal customer satisfaction increase their importance. Most of you will be familiar with the HR Shared Service Center model, (HR SSC), which operates alongside specialist HR Centers of Excellence and Strategic HR Business Partners. 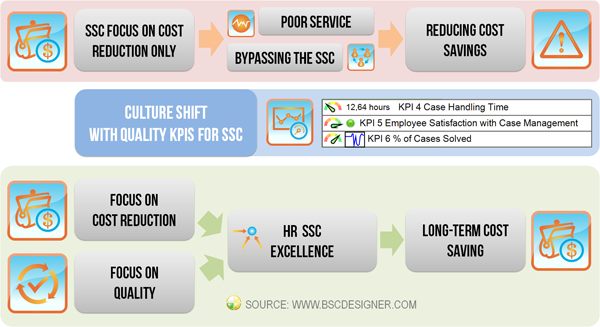 The idea is that the HR SSC acts like a first/second line customer service center for staff, freeing up time for HR specialists in the centers of excellence, and helps HR Business partners to deliver strategic, valued added HR interventions for the individual business units. The HR Shared Service model has become increasingly popular, and current estimates suggest that 75% of the Fortune 500 use some kind of shared services model. Even though HR shared services are becoming the norm amongst multinationals and public sector organizations, we should not take them for granted as they can’t be considered an outright success. For example, this white paper by the Hacket Group, citing recent SHRM research suggests that it may be too early for self-congratulatory back slapping, as while cost reduction is undeniable, customer service levels in HR SSCs leave a lot to be desired. The study found that the metrics to evaluate customer/user satisfaction were not actually present on most business scorecards which means that customer satisfaction was not on the radar of most companies. We suggest that companies focus their scorecards on both scale economy and quality KPIs. When formulating HR strategy by following the Balanced Scorecard approach, we need to understand what the challenges are that we have to address. We invited Kazim Ladimeji, the director of http://thecareercafe.co.uk to share his experience on the topic. Aleksey: What are the key trends that talent specialists need to take into account today? Kazim: The business world is having to deal with change at an unprecedented rate, largely due to the modern technological revolution and today’s consumer’s insatiable urge for mass customization, technological innovation and instant gratification. Aleksey: SWOT analysis is one of the business tools that managers can use to sort out their thoughts about possible improvement strategies. Let’s discuss the example of SWOT application in the talent management domain. Kazim: There will be many external pressures acting on your business and HR function, and there are many potential strategies you can adopt to help meet these challenges. The best way to see through the fog is to conduct a simple SWOT analysis, much like we’ve prepared below to help you decide your modern HR priorities and focus your balanced scorecard. Located right next to a University campus. Able to attract talent in specific areas. Pretty good training programmes in specific areas. Managers good at motivating staff to meet monthly deadlines. Pretty good compensation and benefits offering. Bring a greater focus on ‘inclusion’ as well as diversity to widen access to talent. Explosion in wearable technology in the work-place creates opportunities to use mobile apps to motivate staff. Make more use of big data to improve decision-making. Lack of trust and respect in management. Struggling to attract talent in specific areas. Employee turnover levels above industry standards. Middle managers and especially disengaged. Demand for talent continuing to outstrip supply. Entering a 4-year period of very high staff turnover/low loyalty. Employee engagement levels continue to stay at rock bottom. Low wage economy so people working two jobs. Explosion in wearable technology in the work-place creating privacy issues. Increasing intergenerational tension in the workplace. Aleksey: What outcomes of the SWOT analysis would you implement in the HR strategy? Kazim: You may, of course, have your own priorities but based on the SWOT analysis above, four key HR priorities have emerged, and these need to be reflected in the HR Balanced Scorecard if it is to be relevant. A drastic need to upgrade retention programmes due to an up-coming period of high staff turnover. New talent attraction strategy required as talent shortages are getting worse. Putting data and statistics at the heart of HR decision-making. Aleksey: Thank you Kazim. I believe our readers will find the mentioned trends and an example of HR SWOT analysis useful for their strategy scorecards. Now, let’s use the findings of this article, and build a Balanced Scorecard for HR. Who are the customers of HR? Other business units who need good specialists to execute their strategies. What do HR customers need? Following the trends discussed above, we can formulate these two goals. Leading performance comes from the “Recruitment programs improvement” goal from the Internal perspective. Leading performance comes from the “Diversity and inclusion” goal from the Internal Perspective. How can HR specialists achieve these goals internally? Where should the learning efforts of HR be focused on? What financial outcomes can an organization expect after successful execution of this strategy? A good strategy is a product of discussion. You can use the template of the HR scorecard from this article as a starting point for your own strategy discussion. Make sure that top managers from different business units contribute to this discussion. Probably, they will come up with some great goals and KPIs not mentioned in this article. Finally, the goals of the HR scorecard have to resonate with the overall strategy of the organization. The most important HR KPIs are those that are aligned with your HR strategy. We have discussed many talent metrics in this article but only used a few on the final strategy scorecard. Formulate your HR strategy to address the emerging trends of talent management, then find the proper KPIs to track your success. HR Balanced Scorecard discussed in this article as a starting template for your own scorecard!